Experiment: Make characters out of dyed eggs. Rule #1 don't drop the egg or they will crack and crack won't dye correctly (see line near cup). This little guy went through this process: Here's my link "How To: Blow the yolk out of an egg"
1. Blow yolk out of egg by tapping large pin through both top and bottom then make bottom hole bigger; I use a dremmel tool. Clean out the egg thoroughly and let dry. 2. Hot glue the ends closed. 3. Dye egg. This will require weighing the egg down because now it floats. I used a small snifter glass. 5. For this guy I shined him up with a polyurethane spray. I hot glued a toothpick into the bottom to use to hold and dry the egg. 6. 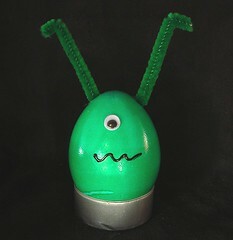 Carefully poke a couple holes into the egg and insert the pipe cleaners. Hot glue the antennas in place. 8. Paint on the mouth; but don't use water-based paint. I actually used a fabric paint. 9. I used an emptied tea light holder for this guy which is pretty fitting for this theme.